BASE UNIT – used to control the volume, how often the unit emits sound and how many speakers are actually sounding. 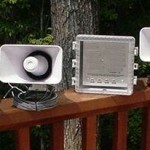 LOUD HORN SPEAKERS – 4 Horn speakers come with the unit, each having 100 feet of speaker wire. 110 VOLT POWER SUPPLY – Used to convert 110 volts to 12 volts, this unit needs to be plugged in for constant power. TIMER – This Intermatic timer should be used when you have birds which are following a distinctive pattern of activity. WHERE TO USE IT: Outside where you want to rid property of nuisance bird types listed above. Common areas include river front, lake shore, seashore, marsh land, ponds, golf courses, open fields and generally anywhere such birds are present and unwanted. RATE OF APPLICATION: The basic unit has a volume setting which can be adjusted to handle small lots of less then an acre to up to 7 acres. The installation of two units has some type of "additive" effect which enables the two units to impact more then 20 acres when configured properly.